Have any of you ever been duped by counterfeit money? I’ve never experienced getting stuck with counterfeit money and I hope I never do. But I know others have. And that’s got to be a terrible feeling. Imagine that you’re selling your car on Kijiji for maybe a couple thousand dollars. Some guy comes and checks it out and want to pay cash for it. So he gives you 20 one hundred dollar bills. He takes the car, you take the money and when you go to deposit it in the bank, the teller tells you that it’s all counterfeit. It’s fake. You got ripped off and there’s nothing you can do about. That would stink big time! Wouldn’t you be mad? Mad at the guy for ripping you off and mad at yourself for not checking the money closer? No body likes getting duped. But you know, people get duped all the time. Not just with counterfeit money, but with all kinds of things. We get duped by the “no-money-down” commercials on tv, or the “drink this beer and life will become a party” advertisements. We’re likely to see several of those during the superbowl this afternoon. We get duped by the big promises of the lottery tickets or by investments too good to be true.” You read in the news about people who have invested all their life savings with a certain investor only to find out later that the investor was a fraud and all their money is gone. They were duped and now they have nothing. And while its certainly painful to get deceived out of your hard-earned cash, it’s tragic when people get duped in areas of life that are far more serious. We live in a world where many people have been duped about God – about who He is and what He’s like – About the meaning of life and realities after death. Our world is full of counterfeit religions and counterfeit beliefs. And getting duped by those are far more serious than getting duped by a used-car salesman. I mean, we’re talking about life-changing, eternal consequences here. So it is absolutely imperative that we can sort out what is true and real and what is counterfeit when it comes to our beliefs about God. And what makes it increasingly difficult is that many of these counterfeits are very convincing. I mean, that’s the nature of a counterfeit – it looks like the real thing. If it wasn’t convincing, no one would fall for it. So with so many convincing, yet different beliefs about God and life and death out there, how do we make sure that we know what is really true and real? How do we keep from being duped? Well, the people that lived in the city of Colossae had the very same dilemma. Now, if you’re not familiar with the city of Colossae, that’s understandable. It’s one of those ancient cities that have long since disappeared from the map. Well, I guess that’s not entirely true. You can still find Colossae today (it’s in modern day Turkey) – but it’s not a really a thriving city anymore. I found just a couple of pictures on the internet of what Colossae looks like today. It’s pretty much just a grassy hill. Well at one time, around 60 AD, Colossae was a grand city and was home to a newly planted church. Now in your Bibles you find a book called Colossians. This is a letter written by Paul to the church in Colossae – to the Colossians. Now it’s interesting to note that Paul didn’t start this church. He started a lot of churches in a lot of cities, but the church in Colossae wasn’t one of them. In fact, this church was started by a man named Epaphras. And as far as we know, Paul had never even been to Colossae. So why did He write this letter to the Colossians? Well, it seems that the church in Colossae was having a hard time with counterfeits. Not counterfeit money – but counterfeit beliefs about God and Christianity – specifically about the person of Jesus. There were these false teachings going around and people were getting duped. They were being deceived. And so Paul wrote this letter to the Colossians to set the record straight – to give them the truth about Jesus Christ and about Christianity. And so basically, these four short chapters in the book of Colossians are Paul’s summary of the Good News. They explain who Jesus really is and what He’s really done – and how we are really supposed to live because of that. It’s Christianity in a nutshell. And so that’s what we want to look at for the next several Sundays. 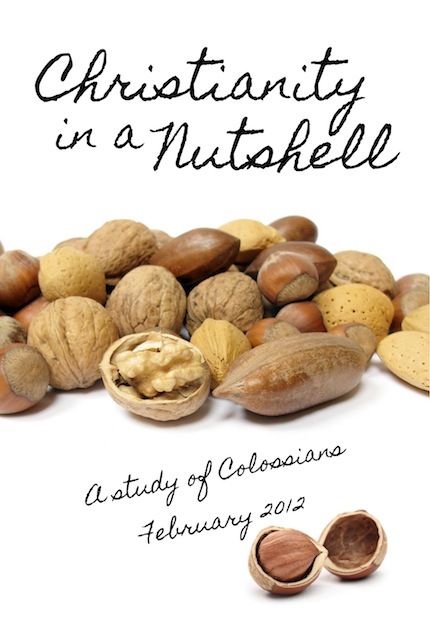 Paul’s Christianity in a nutshell – the book of Colossians. And our aim is to learn the truths of the Gospel so that we don’t get duped. To understand the truth of who Jesus is, what He has done for us, and how we are to respond to Him because of that. I want to begin by giving you a quick overview of the first 14 verses. This is pretty much all introduction, but even in this introduction, there are some good nutshell truths about Christianity. This is what we are going to look at today. So if you have your Bible with you, you can follow along in Colossians chapter 1, verses 1 through 14. “This letter is from Paul, chosen by the will of God to be an apostle of Christ Jesus, and from our brother Timothy. 2 We are writing to God’s holy people in the city of Colosse, who are faithful brothers and sisters in Christ. May God our Father give you grace and peace. 3 We always pray for you, and we give thanks to God, the Father of our Lord Jesus Christ. 4 For we have heard of your faith in Christ Jesus and your love for all of God’s people, 5 which come from your confident hope of what God has reserved for you in heaven. You have had this expectation ever since you first heard the truth of the Good News. 6 This same Good News that came to you is going out all over the world. It is bearing fruit everywhere by changing lives, just as it changed your lives from the day you first heard and understood the truth about God’s wonderful grace. 7 You learned about the Good News from Epaphras, our beloved co-worker. He is Christ’s faithful servant, and he is helping us on your behalf. 8 He has told us about the love for others that the Holy Spirit has given you. 9 So we have not stopped praying for you since we first heard about you. We ask God to give you complete knowledge of his will and to give you spiritual wisdom and understanding. 10 Then the way you live will always honor and please the Lord, and your lives will produce every kind of good fruit. All the while, you will grow as you learn to know God better and better. Wow, and that’s just the introduction! Paul hasn’t even gotten into the meat of his message and we’ll get into that next week, But in just these first fourteen introductory verses, we find all kinds of ‘nutshells truths’ about Christianity. And if we were to try to dig them all out, I’d probably be preaching on Colossians for the next several months. That’s not my intention. I’m just going to pull out a few of the main ones, and I’ll leave the rest for you to dig out in your own study over the next few weeks. And by the way, I would encourage you to do just that. Take some time this week to re-read through this passage and see what other truths you can dig out of there and apply to your life. But for now, let’s start with this one: In a nutshell, Christianity is about changed lives. Look back at verse 6. Christianity is about changed lives. It’s not about going to church. Or doing good things. Or being a good person. It’s not about following all the rules. It’s about God changing your life. We talked back in December about how, when Adam & Eve rebelled against God in the Garden of Eden, everything got messed up. God’s perfect plan for a perfect life got turned on it’s head and life became difficult, painful, empty. Well, Jesus came to change all that. He came to change people’s lives. What a change! Your sins were forgiven. Your guilt was removed. Your eternal destination was changed from death to life. You went from being an enemy of God to having all the rights and privileges of His Son. You were rescued us from the kingdom of darkness and transferred into the Kingdom of God. And what’s more, everyone one of us who have accepted Christ as our Saviour have experienced those same spectacular changes! Christianity is about changed lives. If I were to take this microphone and walk around this room, we could spend the rest of the morning (and the afternoon too) listening to the stories of how God has changed your lives, because that’s what Christianity is all about. So that’s our first ‘nutshell truth’ that we find in this introduction – Christianity is about changed lives. And actually that verse 14 leads us to the second ‘nutshell truth’ that we want to look at – Christianity is about freedom and forgiveness. This is the truth that changes our lives. When Jesus died on the cross in our place, He took our sins upon Himself so that we could be forgiven. He purchased our freedom with His life. If you spend any time reading the New Testament, you’ll find this theme pop up again and again. Let me show you just a few quick verses. For there is only one God and one Mediator who can reconcile God and humanity—the man Christ Jesus. 6 He gave his life to purchase freedom for everyone. God sent him to buy freedom for us who were slaves to the law, so that he could adopt us as his very own children. 7 Now you are no longer a slave but God’s own child. And since you are his child, God has made you his heir. So we praise God for the glorious grace he has poured out on us who belong to his dear Son. 7 He is so rich in kindness and grace that he purchased our freedom with the blood of his Son and forgave our sins. Christianity is all about true freedom and forgiveness. And they go hand in hand. Because God has forgiven us, we have freedom from death. The Bible tell us in Romans 6:23, that the wages of sin is death – eternal separation from God. But because God has forgiven our sins, we have the gift of life and are free from death. John 3:16 says that whosoever believes in Him, shall not perish but have everlasting life. We’re free from death. We are also free from sin. Romans chapter 6 tells us that that before Christ, we were slaves to sin. Sin was our master. And you know, Satan has done a great job of convincing people otherwise. So many people in the world believe that becoming a Christian will cost them their freedom. They believe that Christians have to follow all these rules, but as ‘sinners’ they are free to do whatever they want. But they don’t realize that they are slaves to sin. They are slaves to their own sinful desires. Slaves to their addictions. Slaves to bitterness and anger. Slaves to selfishness. And these things that they consider to be ‘their freedoms’ now, will slowly but surely destroy them from the inside out. But Christianity is about true freedom. Freedom from death. Freedom from sin. Freedom from guilt. Freedom to be the people God created us to be. Freedom to live the way God created us to live. Freedom to experience the joy and peace that only comes from God. That’s the kind’s of freedom we have – and it’s all made possible because God has forgiven our sins. If you forget every other ‘nutshell truth’ that I talk about in this series I want you to remember this one so that when someone asks you what Christianity is all about, you can tell them it’s about freedom and forgiveness. So we have not stopped praying for you since we first heard about you. We ask God to give you complete knowledge of his will and to give you spiritual wisdom and understanding. 10 Then the way you live will always honor and please the Lord, and your lives will produce every kind of good fruit. All the while, you will grow as you learn to know God better and better. This is pretty much the best summary that I can think of that describes God’s purpose for your life. This is, in a nutshell, what God desires for you. God wants you to have complete knowledge of His will. That’s not just knowing about God – that’s actually KNOWING God. Getting to know God’s heart. Knowing what He loves and what He hates. Knowing what He wants to do in the world, what He wants to do in your community, what He wants to do in your life. That’s knowing God’s will. And with that, God wants you to have spiritual wisdom and understanding. That means, along with knowing God’s will, you can see how you fit in to God’s will. How you can live in such a way that reflects God’s will. How you can carry out God’s will in your words and actions. That’s spiritual wisdom and understanding. And when those things are present in our lives, the result is that we will live lives that please and honor God. Lives that produce every kind of good fruit. And through it all, we will grow as learn to know God better and better. Isn’t that what you desire for your life? That’s sure what I desire for mine. I want to know God’s will. I want to understand how I can be a part of what God’s doing. I want to honor and please God with how I live my life. I want to produce all kinds of good fruit through my life. And I want to grow and learn and get to know my Creator. And what’s cool, is that’s exactly what God wants too. And not just for me. He wants that for you too. That’s His desire. That’s His purpose for you. Next Post Who Is Jesus? Jonathan, His Armour-bearer, Six Hundred Men with Pitchforks…And God.